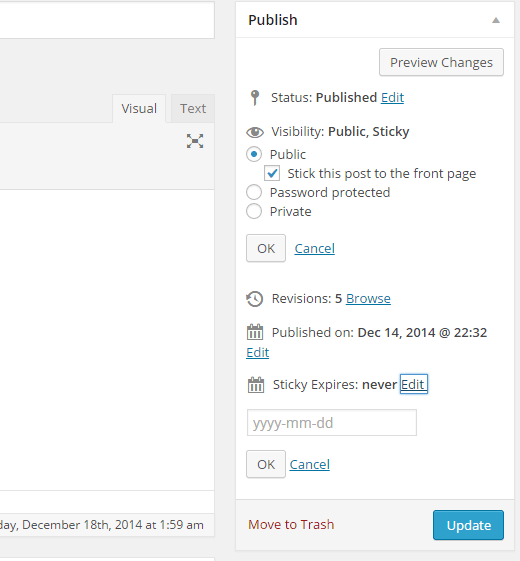 Did you know that WordPress allows you to feature your posts by using sticky posts feature. However, sticky posts are one of the least known features of WordPress. 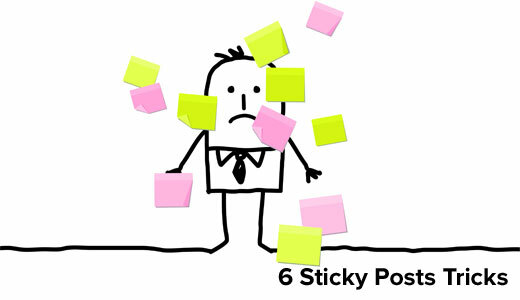 In this article, we will show you 6 cool things you can do with sticky posts in WordPress. If you are using sticky posts to highlight a special event or coupon, then you will need to unstick the post once that event is over. This sounds like unnecessary work that you should automate. Simply install and activate the Expire Sticky Posts plugin. Upon activation, you can set expiry date for sticky posts. After the expiry date, your sticky post will automatically become a normal post. For detailed instructions take a look at our tutorial (with video) on how to set expiration date for sticky posts in WordPress. By default, sticky posts only appear on the front-page of your site. But what if you wanted to display featured content on your category archive pages? You can do that by installing and activating the Category Sticky Post plugin. Upon activation, edit a post that you want to feature and select the sticky post category. 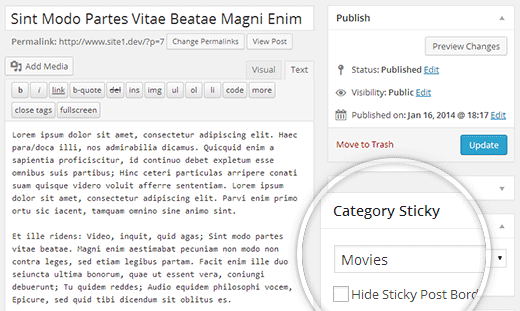 For more detailed instructions, see our tutorial on how to add sticky posts for categories in WordPress. Typically sticky posts are used for featured posts to display your most prominent content. But after a while your old featured posts disappear under the archives. You can bring back your old featured content to life by showing them on custom archives page or anywhere else on your site. Simply paste this code in your theme’s functions.php file or a site-specific WordPress plugin. After adding this code, simply create add the shortcode [latest_stickies] wherever you want to display your latest sticky posts. For detailed instructions, visit our article: How to display latest sticky posts in WordPress. Sticky post feature is only available for WordPress posts, but this does not mean that you cannot add this feature for other post types. Simply install and activate the Sticky Custom Post Types plugin. Once you have activated the plugin, visit Settings » Reading and enable sticky posts for any post type you want. For more detailed instructions check out our tutorial on how to add sticky posts in WordPress custom post types. When using sticky posts, you will notice that by default WordPress displays your sticky post at the top of all your WordPress posts. For example, if you have a loop to show recent posts, then sticky posts will appear on the top no matter when they were added. See our tutorial on how to exclude sticky posts from WordPress loop for more detailed instructions. Want to add custom styling to your sticky posts? 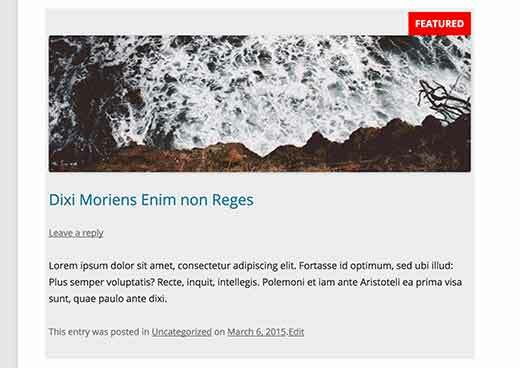 Many WordPress themes use post_class() function to automatically add post classes for each post. 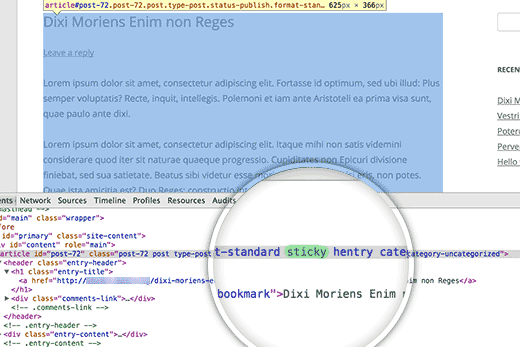 If your theme is already using post_class() function, then you will see sticky class added to your sticky posts. If your theme is not adding sticky class to the post container div, then you can add that yourself by adding post_class() function into the post div or article container. 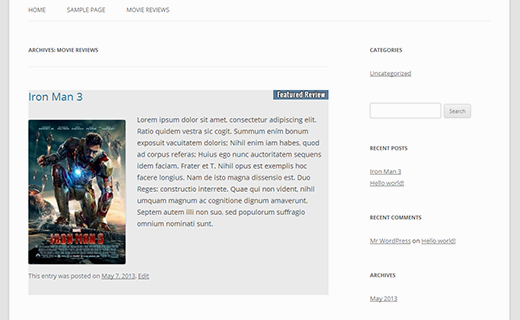 This is how it looked on our demo site using Twenty Twelve theme. 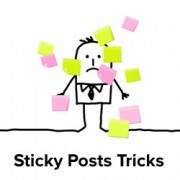 That’s all, we hope this article helped you learn some cool things to do with sticky posts on your WordPress site. You may also want to check out our guide on 10 most wanted category hacks and plugins for WordPress. The sticky post plugin hasn’t been updated in over two years. it’ possible to saves the notes in profile page of users ? Yes you got the point. First you will install the plugin to enable sticky posts for categories. After that you can make posts sticky for specific categories. Later you can make it unsticky. Your post will remain live and will not give a 404 error. This site is an excellent source for all things WordPress. I just finished the article on sticky notes and instantly thought of product launches. Post your sticky note squeeze page and program it to auto expire once you are ready to get back to business as usual. Great article and great site. I was just tango-ing with sticky post customization this week. This is a very good overview of sticky post capabilities. Thanks! So would some of this be helpful if I wanted to display in a dedicated area only the category “News” that were sticky?Then when the news was stale it would drop off but not be gone and prevent a 401 error? Or is there a better way or plugin to do this for non-coders?